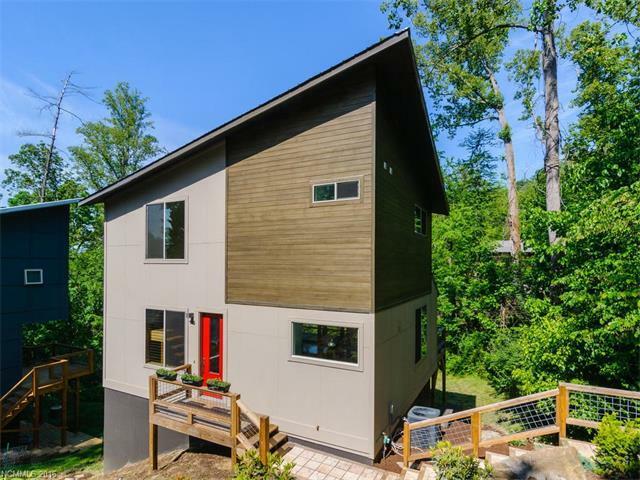 Enjoy breathtaking sunsets and long range mountain views from this amazing triumph of modern design, right in the heart of North Asheville. Within 15 minutes you can be riding the Blue Ridge Parkway, running the trails at Bent Creek, or paddling the French Broad. Enter this 2014 custom-built home and you are greeted with light and luxury. Gorgeous reclaimed wood stairs and accents, high-end DCS Fisher & Paykel stainless appliances, and beautiful custom granite island in kitchen. Directions: From Merrimon Ave, turn left on Fenner Ave, drive to end of Fenner and turn right on Stillwell. Modern design home with long range views! Great access to Bent Creek trails and the Blue Ridge Parkway! I love this look and feel of this home. Built in 2014 so everything is basically new and a great location too! Unique modern design in a desirable location. Knew it would go fast! Great looking home in the heart of North Asheville. Love that is almost brand new! This home has great style and was very well built. No wonder it didn't last long...Give us a call today so that you won't miss out! Within 15 minutes you can be riding the Blue Ridge Parkway, running the trails at Bent Creek, or paddling the French Broad. Enter this 2014 custom-built home and you are greeted with light and luxury. Amazing properties, the style and finishing's are perfect and what a great location!